If you love Christmas, you will adore The Inn at Christmas Place! Imagine for just a moment, a place where it's Christmas all year; where the air breathes the vitality of that season of giving, the mistletoe is hung in July and the glint of crystal in firelight is reflected in a hundred silver globes on Christmas trees. If you can imagine that, you might have just a glimpse of what this resort hotel is like. We decided to do something special this year for a Christmas vacation so we made reservations in Christmas, the Inn at Christmas Place that is. As we drove by, the Inn appeared to be even more beautiful than the photos in the brochures. It was like a mountain-village in the Alps, all decorated and lit up. 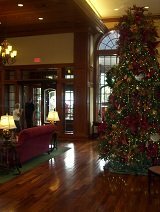 When you walk through the big front lobby doors you are greeted with an elegant grand atrium complete with a huge Christmas tree. The lobby is warm and inviting and although decorated with Christmas it’s not over done. We caught the spirit of the season the moment we arrived from the warm welcome we received from the friendly door man. We even noticed a wonderfully unique aroma in the lobby and the rooms! Christmas, of course, is the overriding theme of The Inn at Christmas Place. But this is the sort of Christmas most people only have in their dreams. The architecture at the Inn is a Victorian theme, and the décor inside is based around the same warm, homey style. We enjoyed just taking a few moments to relax on the second story balcony in the atrium and watched the fire flicker in the large beautiful stone fireplace. The Inn at Christmas Place also has an on-site art gallery! Many of the prints throughout the hotel are of course winter and holiday themed prints by some very talented area artists. Another crowning feature of this unique hotel is the giant Glockenspiel. This structure is three full stories of baroque glory that goes off every hour from 10 am to 9 pm, delighting guests with beautiful chimes and music for the season. 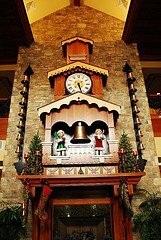 Our kids sat and stared at the many elements of this mechanical work of art with figures that move and the sounds of cast brass bells. 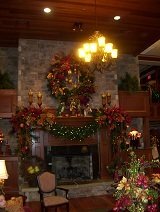 The Inn at Christmas Place has over 140 rooms and suites offering several options to choose from. They offer typical rooms, to mini-suites, to large multi-room suites. In some rooms, you'll find two-person whirlpool tubs, and many also have the ultimate Christmas treat…a real fireplace. Many rooms have private balconies overlooking the absolutely beautiful gardens in the courtyard, or with views of the Smoky Mountains. Christmas-themed rooms are also available upon request…all year round! We chose the mini-suite with a fireplace, a two person Jacuzzi and a king bed with a sleeper sofa. There is also a wonderful private balcony facing the pool and courtyard. Our room had a refrigerator and microwave, a large flat screen TV and there is a lot of drawer space. The custom beds and linens are very nice…designed and made just for The Inn at Christmas Place. The beds are the most luxurious and comfortable beds and pillows we have ever slept on! The bathroom was huge and well equipped with nicely scented bottles of shampoos, conditioners and lotions. It was so nice to be able to enjoy the elegance of a Victorian Holiday Christmas from the comfort of our room. All guests of the Inn are greeted with an awesome complimentary breakfast. This is not your typical continental breakfast offering of donuts, toast and juice. The Inn at Christmas Place has full continental breakfast including made to order omelets cooked by a chef. In addition to the omelet station, you can choose from sausages, eggs, fruit, yogurt, waffles, oatmeal, pastries, cereals, juices, milk, coffee, hot chocolate and more. We would also suggest trying the Southern home made biscuits, gravy and grits. It was nice for the whole family to fill up and be ready for a full day of activities. Not everything at The Inn at Christmas Place is Victorian. To the delight of the kids, you'll find two inviting pools, a heated indoor pool and a large hot-tub. An outdoor pool, open during the summer months has an amazing 95’ figure-eight waterslide that the kids will absolutely love. So while the kids were having fun in the pool, we were able to watch them from the oversize hot tub or from one of many patio chairs. There's also a game arcade, an excellent fitness center and a business center should you have some extra work to finish. When you check out of the hotel, the Inn gives you a coupon for a free ornament at The Christmas Place, the namesake store for the inn. It is well worth the visit and just directly across the Parkway! This is an amazing one of a kind Christmas shopping experience with absolutely everything to make your season bright. The Inn at Christmas Place will delight you with Christmas cheer all year round. With its great atmosphere, friendly staff, and fantastic amenities, we found it to be perfect for our family. The staff also helps set the atmosphere, from the friendly and helpful housekeepers who keep all the rooms in perfect order, to the Singing Santa who shows up all over the inn. He always joins guests for breakfast and has regular concerts out in the lobby. Make sure your kids get to see him at least once; it's guaranteed to make their vacation. 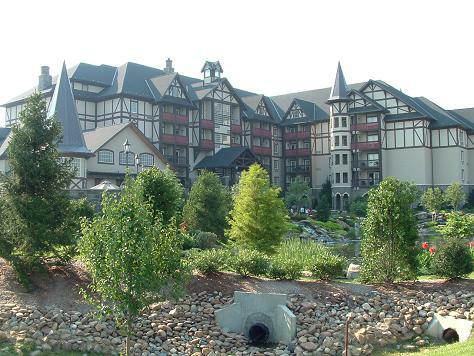 The Inn at Christmas Place is walking distance to many fine dining options and also just minutes from Dollywood, the major shopping malls, attractions, golf courses and the Great Smoky Mountains National Park. 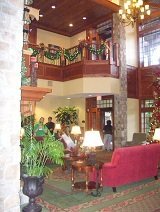 It is located right in the center of Pigeon Forge right off the main Parkway and is convenient to just about everything.